The free perma MLP web application offers central management for lubrication points. perma MLP APP helps the maintenance staff record all maintenance and exchange work of perma lubrication systems on site. The new perma SELECT APP is a great tool for calculating the required re-lubrication amounts in different industries. It has never been easier to determine correct lubrication amounts for electric motors, pumps, conveyor systems, blowers and fans. The new catalog is here! 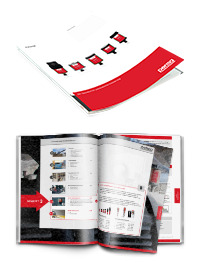 The design focuses on users´ points of view and leads them to optimal lubrication solutions in 3 easy steps - including mounting solutions. What do I need for the installation of a perma lubrication system? How do I program the right discharge period? What should I consider when I exchange a perma lubrication system? Euerdorf, Germany – Electric motors are found in all types of applications – fans, blowers, pumps, conveyors, etc. Electric motors are found in all types of applications – fans, blowers, pumps, conveyors, etc. The importance of the electric motor is usually not recognized until it fails. Optimal lubrication is the key to increase process safety, equipment service life and productivity. Euerdorf. perma-tec, the expert in automatic lubrication, is setting new standards with the release of its automatic lubrication system perma STAR CONTROL Generation 2.0. For more than 50 years, perma-tec has been known for innovative lubrication solutions. The new perma STAR CONTROL Generation 2.0 is extremely flexible and user friendly.